Today's post is a little different. If you've been following my blog for awhile, you know I don't share too many details of my personal life on here. It's an Internet world after all and I just don't feel comfortable doing so. However, I happened to listen to one of Dr. Laura's calls on my way to work this morning and it really hit home. She gave me the encourage to share my story with you while my feelings are still fresh. Some might get it, some might not and that's OK. If you're in the same situation, knowing that you're not alone and I hope you can relate. This caller asked Dr. Laura about how to deal with a clingy friend. While the topic wasn't exactly that I was dealing with, it was very eye-opening. You can listen to part 1 here and part 2 here if you're interested. The history: I've known this person for over 15 years. We were casual friends for about 6 years. Had a fall out and decided to call it quit in 2008. 4 years later (2012), this person reached out to me and wanted to reconnect. I was skeptical at first but thought it's better to make friends than to make enemies (not exactly enemies but you know what I mean). We slowly but surely started rebuilding the damaged friendship. Even though, I had great memories throughout the years, there was always something holding me back. I never considered this person as a lifetime friend but I can't seem to break this friendship and I didn't know why. It's so clear to me now after listening to Dr. Laura this morning. More on that in a second. 3 months ago, we had another fall out and at this point, I knew it was time to end this friendship for good. I'd be lying if I said this breakup was easy because it wasn't. I've known this person for over a decade and we had a lot of history together. If you're in the same situation, here is how I deal with it. Step 1: Be honest with yourself about what you want to do - For some people, they want to see if there is a chance to rebuild the friendship. For others, they just want to get over it and move on. For me, it's the latter. I am not sad that this friendship is over. It wasn't the lasting friendship that I am looking for. Like I mentioned earlier, there was always something holding me back. I never fully trusted this person after we reconnected. A year ago, I stopped introduce my new friends to this person for the same reason. I don't miss having her in my life. My ultimate goal is to get over the feeling of betrayal. Step 2: Stop all communication - I have never blocked anyone in my life but I did block this person (on social media, phone number and email). I can't receive calls, text messages or FaceTime from this person. I really should have done this in the first place =) You know sometimes, even if you're no longer in contact with someone but in the back of your mind, you're still hoping to hear from them for some reason. By doing this, I told myself I am through with this person and do not wish to hear from her ever again. Step 3: Process your real emotions - This is what I am doing right now. In today's society, everyone is trying really hard to put on a happy front (even when things were really not going well). People rarely talk about struggles and hard times. Take Kate Spade and Anthony Blourdain as an example. They seemed to have it all but they were in so much pain behind closed doors. Sharing your real feelings does not make you weak or make you a loser. Stress, anger, sadness, and similar emotions need an outlet. Sharing these emotions with someone has tremendous impact on our overall well being. Talk to your family members, your close friends, someone who's willing to listen to you or just write it down on a piece of paper. Step 4: Keep yourself busy - I have so much to look forward to this summer. Road trips with the kids, get together with friends, home improvement projects. I am planning to go back to Orange Theory and start training for my second half marathon in October. I have several job interviews lined up and hope to land one next month. I keep myself busy and enjoy the things I do. Step 5: Focus on the positive - It's hard I know but like everything else, there is a positive and negative aspect to this situation. I finally find myself at peace that this person is out of my life for good. I no longer invest my time and energy to this unhealthy friendship. This relationship brought out the worst in me. I am ready to move on and focus on other friendships that I do have and value. As stated earlier, I am not sad that this friendship is over. I am more angry and frustrated that I wasted 6 years of my life on this so called friendship. I understand this is a very small part of life. People come, people go. It's OK to make mistakes. What important is how to turn mistakes into valuable life lessons. I have so much to be thankful for and I know I will get over this in no time. Thank you for letting me share. If you are (were) in the same situation, I would love to hear your thoughts. Hi, long time reader here. I usually don't comment, but your post today inspired me to. Thanks for sharing your story. 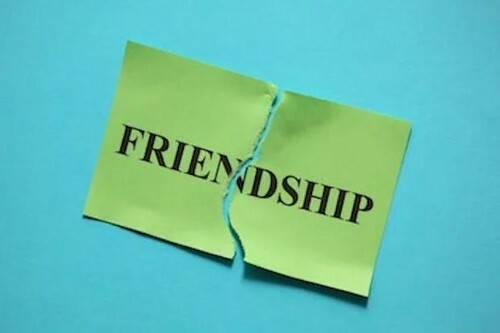 Friendship breakups can be just as painful as relationship breakups, but people don't talk about them as often so I'm glad you brought it up. I have been in a similar situation where I had a terrible fallout with someone I had considered a close friend. It was really stressful and awful, but now I'm finally in a better place. Hang in there. Thank you for sharing your experience. It means a lot to me. Hi Sydney, been through one of those toxic friendship. A true friend should be supportive and shouldn’t make you question the friendship as a whole. All you can do is drop it like a bad habit. I know it’s easier than done. You’ll have a very loving family. Enjoy the summer with your girls and it will be a thing of the past.